The illustrations in advertisements don’t have the same impact as photographs, as with this photo taken about 1890 of an unnamed model. A typical training routine begins with the use of a well-fitted corset and very gradual decreases in the waist circumference. Lacing too tight too fast can cause extreme discomfort and short-term problems such as shortness of breath and faintness, indigestion, and chafing of the skin if a liner is not worn. It should also be noted that lacing too tight or too fast can irreversibly damage a corset and they should be seasoned appropriately. The primary effect of tightlacing is the decreased size of the waist. 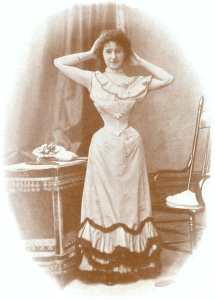 The smallest waist recorded is that of Ethel Granger, who tightlaced for most of her life and achieved a waist of 13 inches (33 cm): a reduction of over ten inches. Such extreme reductions take a very long time to achieve. 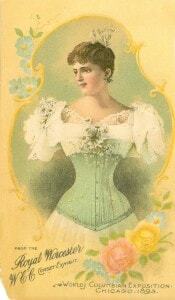 At first, corsets with waist measurements four inches smaller than the tightlacer’s natural waist size are recommended. The length of time it will take a tightlacer to get used to this reduction will vary on his or her physiology; a large amount of fat on the torso and strong abdominal muscles will mean that it takes longer for the tightlacer to wear their corset laced closed at the back. Thereafter, reducing another couple of inches is not much more difficult, but each inch after a six-inch reduction can take a year to achieve…. The volume of the lungs diminishes and the tightlacer tends to breathe intercostally – that is, with the upper portion of the lungs only, rather than the whole torso. Intercostal breathing is what gives the image of “heaving bosoms”. Due to the lower portion of the lungs being used less there is often a stereotype of mucosal build-up there; a slight and persistent cough is the sign of the body trying to clear this (and might also have led to the Victorian hypothesis that corsets caused tuberculosis). The liver is pressed upwards. As it continually renews itself, it adapts to fit its new position, and in a long-term tight lacer it can develop ridges where it rests against the ribs. It is also possible that tight lacing exacerbates the tendency of some livers to develop accessory lobes, to the point where the accessory lobe becomes as large as the main portion of the liver. STAYS AND BONNETS. Then what shall be said about the corsets? does the Ladies’ Rational Dress Association, with Lady Haberton at its head, say about the advertisements in the Queen anent corsets? “They reduce the size of the figure without causing any injurious pressure, while their graceful shape adds a new charm to the form.” Whether the audacity or the mendacity of the statement is the greater may be a matter on which opinions can differ, the magnitude of each being so great. A liver compressed till the marks of the ribs are visible after death; that is not “injurious pressure.” Neither is displacement of some of the less fixed organs “injurious pressure” I suppose? 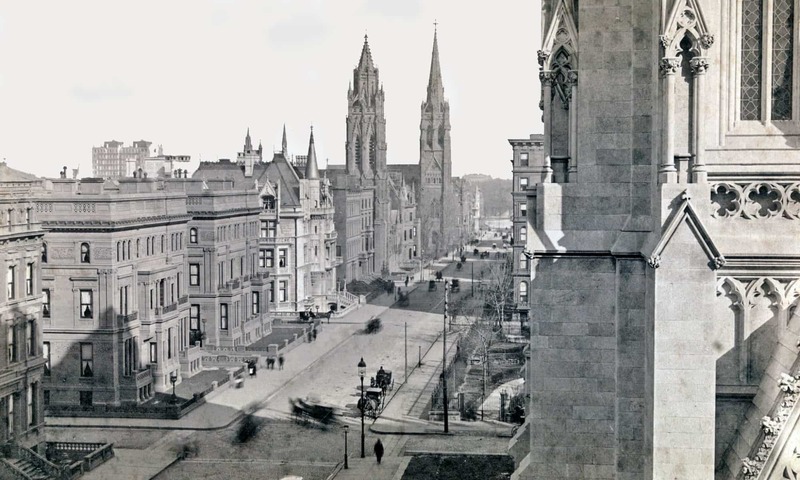 To have the viscera driven downwards until displacement follows is quite a trifle from the modiste’s point of view, perhaps; but to the physician it is a grave matter, often entailing ill health for the rest of a life-time. And as to the “graceful shape of a wasp-waisted lady” that, too, only exists from the modiste’s point of view. Original publication: Western Appeal (Saint Paul, Minn.) Date: October 08, 1887 via clickamericana.com. The Lancet [the premiere UK medical journal]: It has always seemed to us to be somewhat of a satire on the work of nature that the female form should be thought to require the support of a corset in order to make it graceful. We observe, therefore, with satisfaction that ladies — and even young ladies — are here and there to be found who have, with equal courage and good sense, dispensed with this unnecessary aiticle of dress. Among the majority who continue to wear it there are also signs, though less pronounced, of the same healthy tendency. Tight-lacing is viewed with much less favor than formerly. Women as well as men are coming to see that artificial slenderness is not beauty, and indeed the sham and unreason apparent in a figure wantonly contracted must create in all thinking persons a feeling of repugnance which effectualy prevents the possibility of admiration. Victims of this hurtful practice and grievous error in taste are still, however, not uncommon. Only a few days ago, an inquest on the body of an elderly female revealed the fact that death was due to the direct consequence of her having the stays too tightly laced. This is by no means the first instance in which the coveted fineness of waist has been thus dearly purchased. It is, in fact, impossible that this custom can but injure health, for what are its effects? By tight lacing, which forces together the elastic ribs and narrows the space within the thorax, free action of the lungs is obviously rendered impossible, the liver and heart are displaced, and the great blood vessels unnaturally stretched. The unfortunate worshiper of a false ideal loses with free respiration the due effect of the most powerful force which aids the heart in driving its blood through the body — the force of thoracic suction. Displacement of the heart, moreover, can only result in palpitation or severer cardiac troubles. Thus it comes to pass that every organ and tissue is undernourished, digestion is little more than a meaningless term, and healthy life in any part of the body is unknown. This may seem to be forcible language, but it is nevertheless the clothing of facts which it does not merely envelope, but in many cases fits with a strictness not incomparable to the firm embrace of the most fashionably straight corset.